Between 2 Minds, is the newest and most creative source for today's mentalism. 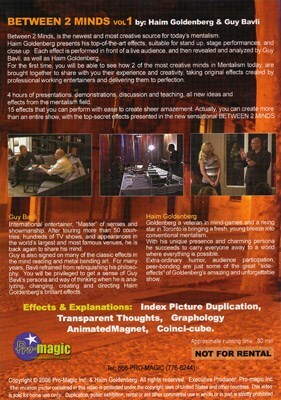 Haim Goldenberg presents his top-of-the-art effects, suitable for stand up, stage performances, and close up. 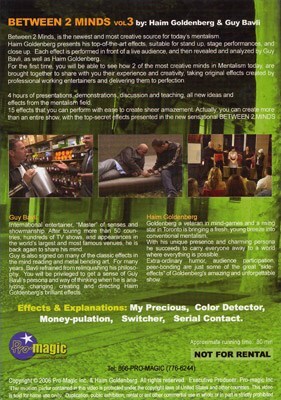 Each effect is performed in front of a live audience, and then revealed and analyzed by Guy Bavli, as well as Haim Goldenberg. For the first time, you will be able to see how 2 of the most creative minds in Mentalism today, are brought together to share with you their experience and creativity taking original effects created by professional working entertainers and delivering it to perfection. 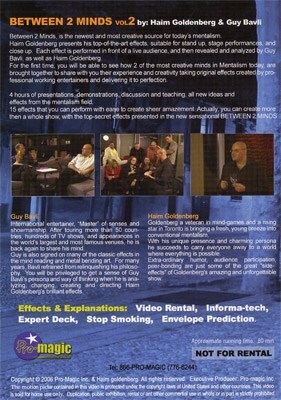 4 hours of presentations, demonstrations, discussion and teaching, all new ideas and effects from the mentalism field. 15 effects that you can perform with ease to create sheer amazement. Actually, you can create more then a whole show, with the top-secret effects presented in the new sensational BETWEEN 2 MINDS (3 DVD set). You ask a spectator to name a movie. You ask him to call your DVD rental store and ask which movie you reserved. It will be the movie they chose. No force - No hints - No gimmicks. Expert deck - impromptu version. The performer knows the location of a freely chosen card, after the spectator has shuffled the deck. The performer causes a smoker from the audience to be repulsed from smoking on stage. Four rings are mixed in a small bags. You then know which ring belongs to which person...and mentally describe in detailed the last ring! Spectator is asked to freely draw 3 shapes in 3 different colors. You then predict it. Spectator hides a money bill in one of 10 envelopes. You then mentally know which envelope is the one with the money. Great gambling effect. A switching tool that will help you create dozens of ideas and routines. The performer predicts a serial number of a borrowed bill from the audience. No switching, the bill is random. The performer predicts a full description of a spectator, freely chosen by the audience. This secret will give you dozens of ideas and effects you can perform. A very clever way to duplicate a picture secretly drawn by a spectator. Perfect for close up!